During winter, animals often must contend with deep snow, which makes movement difficult. 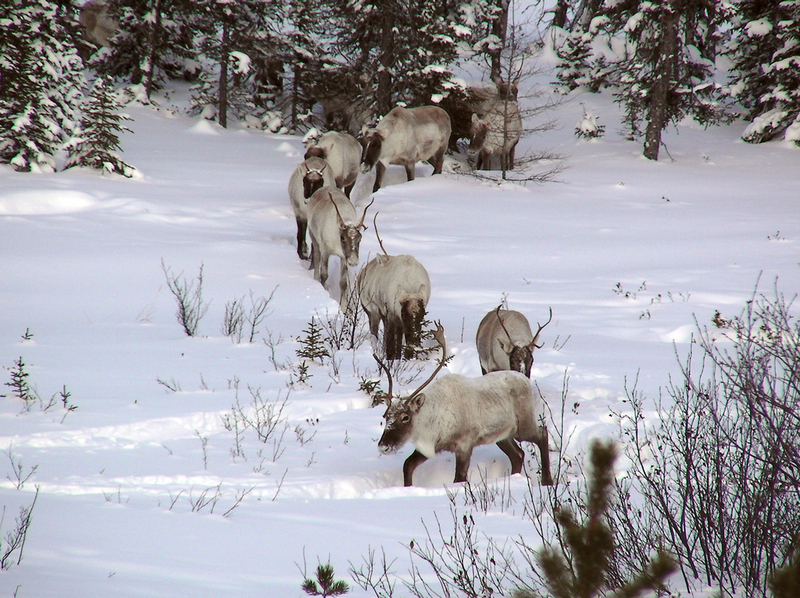 These caribou are walking in single file; a lead animal will break a trail through the snow, and the rest of the herd follows in its tracks. It can be difficult for animals to live in places that receive large amounts of snow, such as in the high latitudes and at high elevations. Snowy places tend to receive less sunlight, which decreases temperatures and makes it hard for animals to stay warm. Deep snow can also be difficult to move around in; animals must spend more time and energy walking through it or finding food beneath it. Some animals have adapted to co-exist with the cold. 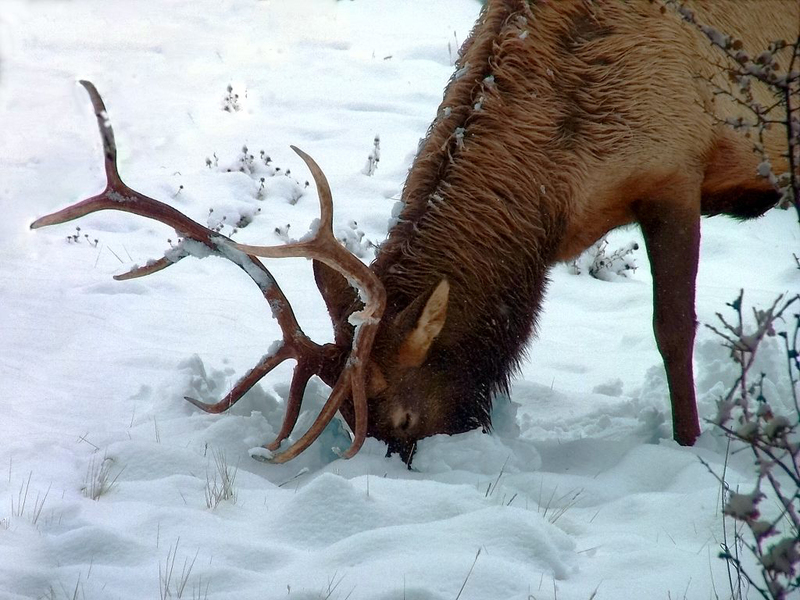 Deer, elk, bison, and other grazing animals use their hooves and muzzles to clear snow away from plants they need to eat to survive. To help retain warmth throughout the winter, they also grow thicker, shaggier coats, which they shed in the spring when the weather becomes warm again. Elk and other grazing animals often have to dig through snow to graze during winter. Other animals, like the snowshoe hare, develop ways to travel on top of deep snow. Snowshoe hares have large hind feet, and they can spread their toes to act like snowshoes, which helps them walk on the surface of deep snow without falling through. Similarly, the ptarmigan, a bird common to the Rocky Mountains, saves energy by walking on top of the snow with its feather-covered feet. 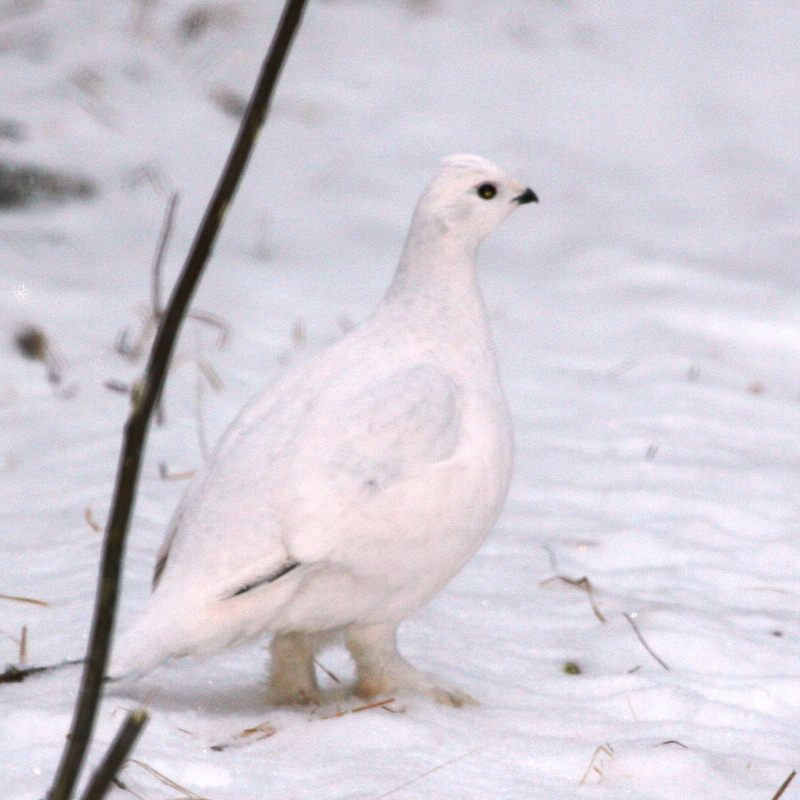 The ptarmigan's feathered feet act as snowshoes, distributing its weight and preventing it from sinking into the snow. The pika, another Rocky Mountain native, dries little bundles of hay in the fall, then brings this food under the snow to spend the winter. The Arctic fox, which must deal with the cold, snowy conditions of the Arctic all year, grows thick fur all the way down to the bottoms of its paws. It has a stocky body, short legs, and small ears, all of which conserve body heat. During cold periods, frogs, snakes, and other amphibians and reptiles slow their body processes almost to a stop, using up their energy very slowly. Some insects have adapted a lifecycle that follows the seasons. They grow and reproduce during the summer months, then die in the fall, leaving their offspring in protective cocoons that will open the following spring. Deep snow can prevent some animals from finding food, but it also acts like a blanket, keeping the ground beneath it warmer than the surrounding air temperature. Some animals take advantage of snow's insulation, and cope with the cold season by building in a protective den or burrow and going into a deep, long sleep, a process called hibernation. Bears and groundhogs, for instance, build up fat reserves in the fall so they can survive hibernating through the snowy winter months, usually not waking again until spring. Some animals simply leave snowy, cold regions during the toughest seasons. Arctic terns, for example, spend the Northern Hemisphere summer in the Arctic, and then migrate to Antarctica for the Southern Hemisphere summer, traveling about 39,000 kilometers (24,000 miles) round-trip each year. 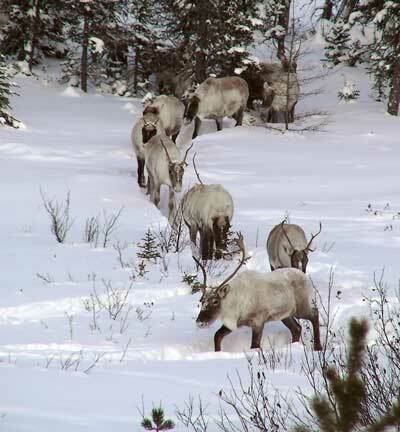 Migration can also happen over shorter distances: Deer and elk in the Rocky Mountains of the United States tend to migrate down into valleys during the winter. The timing of spring snowmelt and autumn snowfall also affects migration. Many migratory water birds take advantage of the 24-hour sunlight and extensive food supplies available during the Arctic summertime. But the timing of birds' breeding and nesting depends on when particular regions in the Arctic become snow-free each spring. Some populations nest in Greenland, where snow melts later in the spring season, and there is a smaller window of opportunity for the species migrating there. Arctic areas of Europe, Asia, and Alaska, however, have recently experienced earlier springtime thawing, resulting in more snow-free patches and longer summer seasons for migrating birds.